Like your portable drives with a splash of color? 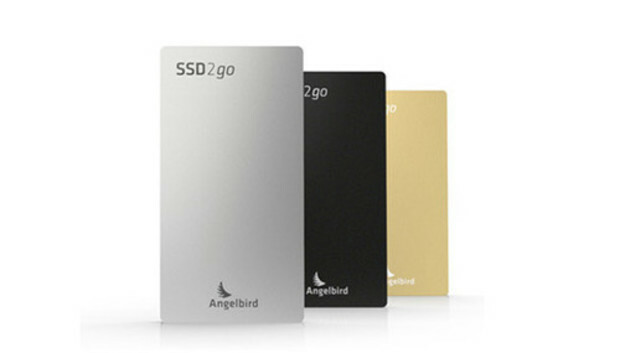 Check out the USB 3.0 bus-powered SSD2go from Angelbird. Angelbird's online store lets you choose between eight different colors for its case and a second of those colors for its backplate. The thin, 0.4 inches thick, SSD2go is similar in size to an iPhone 5c and available in three capacities of solid-state storage: 128GB ($280), 240GB ($450), and 480GB ($790). We tested a silver 240GB model with a blue backplate. This is my first experience with an Angelbird product. The Austria-based company uses top-notch components in their drives, and the unit we tested performed impressively. The drive came formatted as exFAT, which lets you share between Mac and PC, but at the cost of a few megabytes per seconds. As a matter of policy, we here in the lab test Mac drives with HFS+ and PC drives using NTFS. While by no means cheap, the SSD2go is fast. In our Mac tests, the drive was able write a 10GB file at 219MBps and read the same file at 403MBps. It wrote a 10GB folder of files at 189MBps and read that folder at 310MBps. AJA System Test read speeds were recorded at 404MBps, with write speeds of 332MBps. Our PC tests showed similar write speeds, 203MBps for the 10GB file and 173MBps for a 10GB folder. The drive in our PC testbed isn't as fast as the PCIe-connected flash on the MacBook Air we test with, which slowed down the Angelbirds read speeds to 131MBps for the 10GB file and 117MBps for the folder. One curiosity is that the USB 3.0 port on the device is a Type A--the long rectangular one. That means the cable needs to have two Type A connectors, which is not common. One comes in the box, and they are available for purchase, but if you misplace your cable you most likely won't have this type of cable around. The Angelbird is a fast, slim, customizable solid state hard drive that fits in a pocket, but at a price that may not fit your budget.